So despite my lack of height, I have fallen madly in love with maxi dresses. I actually passed out in my maxi dress last night and I have never had a better good night's sleep (but that might also be due to my filling dinner beforehand). I'm looking forward to wearing it to death once the weather cools down, although that probably won't be for a while. As much as I love maxi dresses they are a bit suffocating for my legs when the weather is so hot and humid. Lately I've been missing being able to wander around my town and take crazy self-portraits (like this one). It was always a nice way for me to bond with my camera and spend some time alone. I am enjoying having my mom play a bigger part in my blog though! She's a silly photographer and she's always encouraging me to jump in my pictures. Maybe I'll take my camera out for a photo shoot this weekend. :) And it's officially one week until I get to see Jeremy! He's been studying in Turkey for the past two months and I've been missing him terribly. Seven days could not go by faster. aww! its nice that in only 7 days you'll get to see him :) i like the fact that "vertically challenged" [read: short] girls like myself *can* wear maxi dresses with ease... also, your mom is taking great photos! Love this; simple, and perfect. I adore that dotted tank! I can totally see this becoming a staple for you in the fall. Have fun with Jeremy! Hopefully the week flies by. you look so wonderful, Jen.. I love the way you take your picture from the back-side :D and the sandals it's nice! I love wearing long skirts as well but you're right, they're a little suffocating for the legs. But I love the sandals you are wearing! 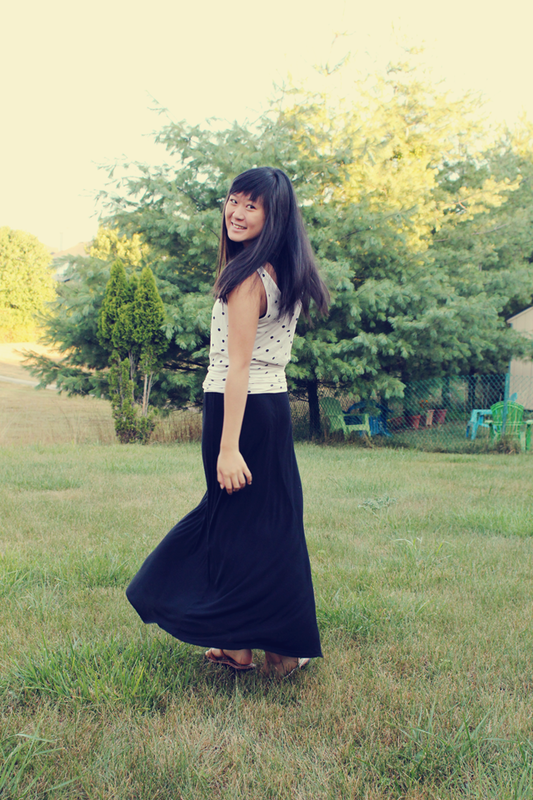 i love how you're styling this maxi!! 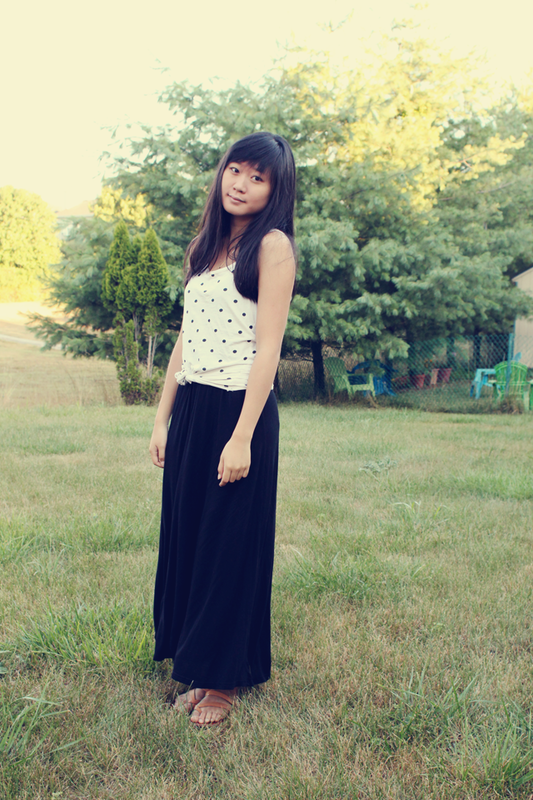 how lucky that you're still tall enough to pair flats with the maxi skirt. Don't take this as creepy but WOW you look astoundingly beautiful here. Picture #3 is gorgeous!